Because in these declassified documents all codenames are redacted, it was largely a mystery which NSA systems were used to store and analyse these metadata. By combining many separate pieces from both the Snowden-documents, as well as those declassified by the government, it now has become clear that NSA put the domestic phone records in its central contact chaining system MAINWAY, which also contains all sorts of metadata collected overseas. Initially it was thought that MAINWAY was a repository just for telephone metadata. This goes back to a report by USA Today from May 10, 2006, which revealed that the NSA created a database containing "the phone call records of tens of millions of Americans" obtained from AT&T, Verizon and BellSouth (the latter merged with AT&T as of 2007). 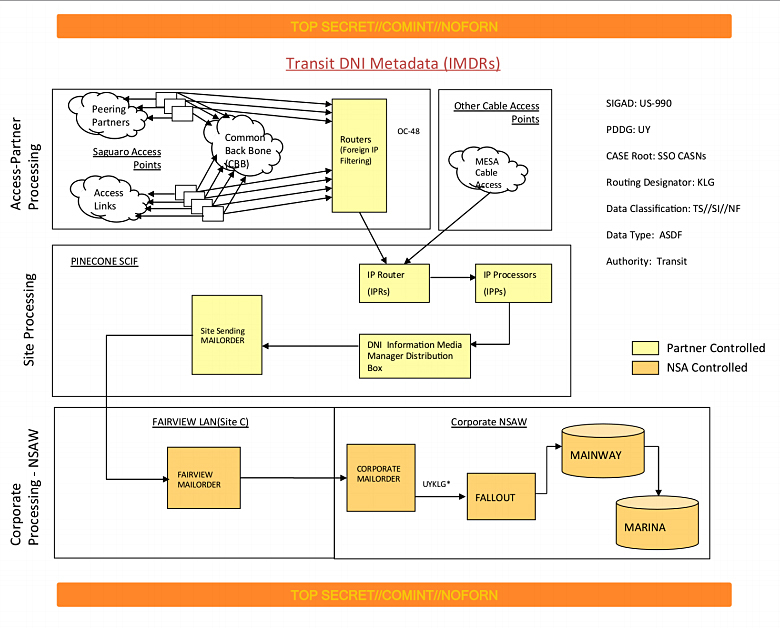 As such, MAINWAY was seen as the equivalent of MARINA, which is NSA's storage for internet metadata. But meanwhile, various documents from the Snowden revelations have made clear that the actual repositories for telephone metadata are ASSOCIATION (for metadata from mobile calls) and BANYAN (for metadata from landline calls). MAINWAY itself isn't just a database that stores raw metadata, but a system that also "performs data quality, preparation and sorting functions, and then summarizes contacts represented in the processed data". Afterwards, MAINWAY stores the "resulting contact chains and provides analysts with access to these contact chains". It seems likely that in MAINWAY, metadata are stored more or less temporarily for the purpose of contact chaining and analysing them. Metadata that NSA wants to keep for a longer period of time, or even indefinitely are then stored in repositories like MARINA, ASSOCIATION and BANYAN. While the domestic metadata collected in bulk have to be destroyed after 5 years, the calling records that are the result of a query can be stored by the analyst. According to the PCLOB-report (.pdf), they may then be "subjected to other analytic methods or techniques besides querying, or integrated with records obtained by the NSA under other authorities", as well as shared with others inside and outside NSA. Based upon Snowden documents, The New York Times reported on September 28, 2013, that MAINWAY is used for chaining both phone numbers and e-mail addresses and that it is fed with data from tapping "fiber-optic cables, corporate partners and foreign computer networks that have been hacked". The report also says that as of August 2011, MAINWAY was fed with "1.1 billion cellular records a day in addition to the 700M records delivered currently". However, The New York Times erroneously attributed these numbers to collection under authority of section 702 FAA and was therefore not able to identify that MAINWAY was also fed with the bulk phone records of Americans (which happens under section 215 Patriot Act). The latter only became clear after The New York Times and ProPublica published some NSA documents about the FAIRVIEW program on August 15, 2015. 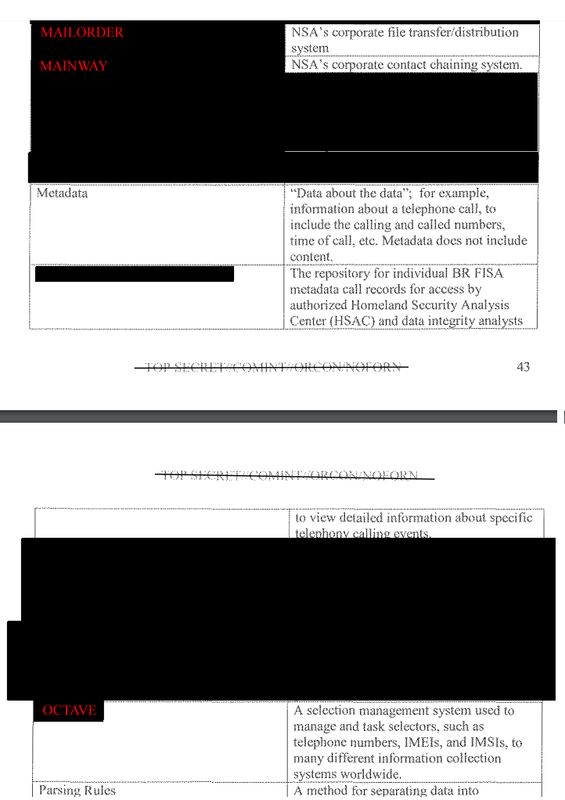 One of these documents confirms that it was AT&T that provided the aforementioned number of records, and also that this happened under BR FISA (= Section 215) authority. So as of 2011, at least 1,8 billion domestic phone records a day were coming in, which makes 54 billion a month and about 650 billion a year. Before they were handed over to NSA, AT&T stripped off the location data in order to comply with the FISA Court orders, that don't allow those data to be collected. Apparently Verizon Wireless and T-Mobile US saw no obligation to remove these location data, so their cell phone records couldn't be collected by NSA, which therefore only got less than 30% of the domestic telephone metadata. According to NSA, one of the advantages of putting phone records from multiple American telecommunication companies in one big repository, was that this allowed analysts "to identify chains of communications that cross different telecommunications networks". NSA started collecting telephone and internet metadata from US telecommunication providers shortly after the attacks of September 11, 2001. 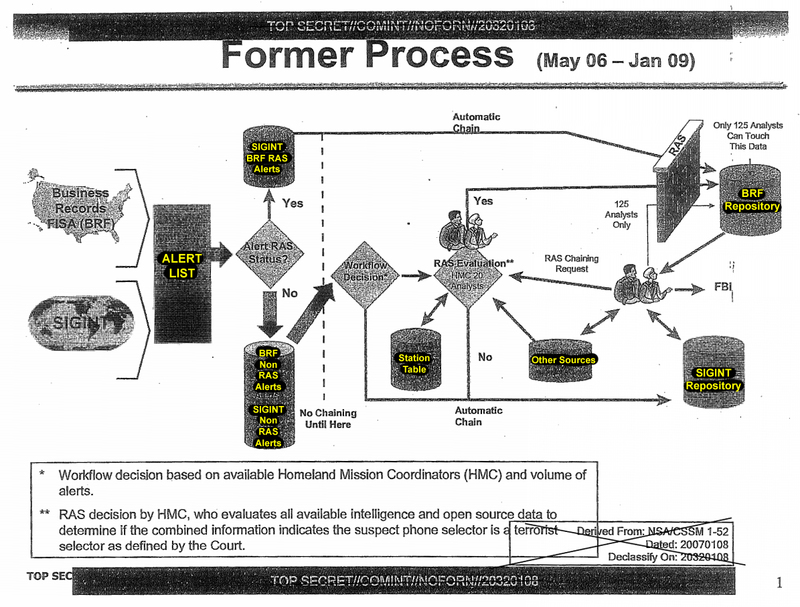 This was part of the President's Surveillance Program (PSP, protected under the STELLARWIND classification compartment), which was based upon what in the end would be 43 subsequent secret authorizations by president George W. Bush. The goals of collecting these metadata were identifying unknown terrorist operatives through their contacts with known suspects, discover links between known suspects, and monitor the pattern of communications among suspects. At first, only metadata were collected from communications in which at least one party was outside the US. AT&T (identified as Company A, codenamed LITHIUM, with collection under FAIRVIEW) started to provide both phone and internet metadata from international channels as early as November 2001. For Verizon (Company B, with collection under STORMBREW) the automated transfer of such data started in February 2002. Qwest refused to hand over its records because the government couldn't present a warrant. Allegedly, raw metadata were transferred in real-time through a high speed data link from the main computer centers of the telecoms to a government facility in Quantico, Virginia. Although Quantico is an FBI compund, the BR FISA review says that it was an NSA mission element, the name of which was redacted, that obtained the records from the providers. Then, parsers were used to filter the metadata of unwanted information (like credit card numbers), and the records were put in a standard format compatible with NSA databases. 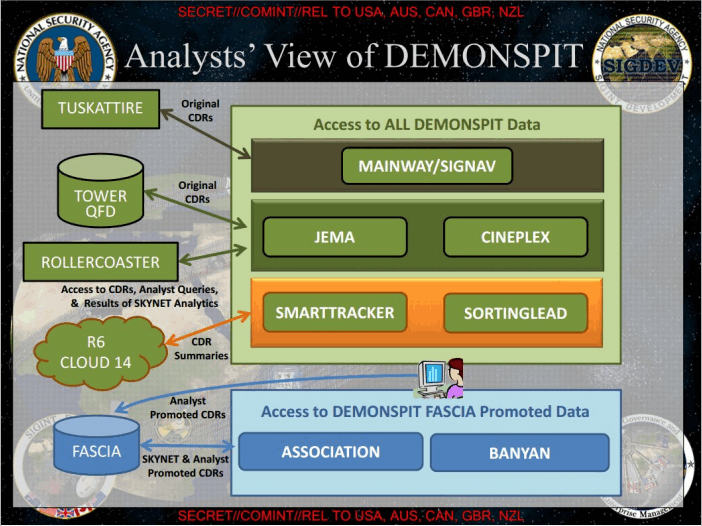 "NSA's primary tool for conducting metadata analysis, for PSP and traditional SIGINT collection, was MAINWAY. MAINWAY was used for storage, contact chaining, and for analyzing large volumes of global communications metadata." In July 2004, the collection of domestic internet metadata was moved from the President’s Surveillance Program to the FISA Court, which authorized this effort based upon section 402 FISA, or as it is called by NSA: PR/TT (short for Pen Register/Trap and Trace). In May 2006, the same happened with the bulk telephone records, for which the FISA Court allowed continuation under authority of section 215 USA PATRIOT Act, or as NSA calls it: BR FISA (short for Business Records FISA). Under the FISA Court orders, bulk telephone collection eventually became to include "all call detail records or 'telephony metadata' created [...] for communications between the United States and abroad" or "wholly within the United States, including local telephone calls". Only metadata of fully foreign communications were excluded, as was the case for most mobile phone calls, due to technical reasons. Because right from the beginning, NSA stored these domestic phone and internet metadata in the same database (MAINWAY) that contains metadata from traditional collection efforts abroad, queries could result in contacts chains made up of identifiers from both foreign and domestic sources. The query tool simply didn't identify the difference. An internal NSA training module from 2011 shows that at least by then, NSA had tagged the metadata records with XML tags to identify not only what legal authority the metadata were collected under, but also the SIGAD of the intercept facility where that had happened. 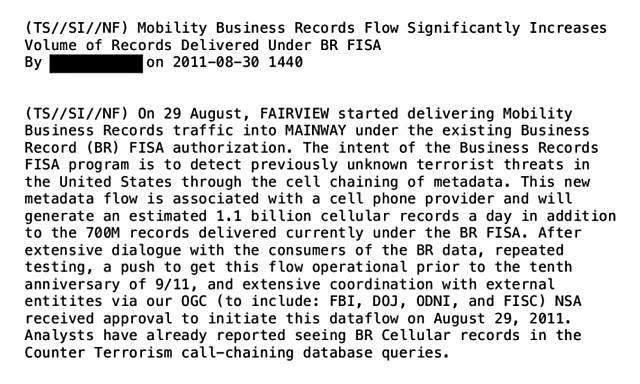 The domestic call records were not only stored in MAINWAY, but also in another database, one that was apparently dedicated for US phone metadata. 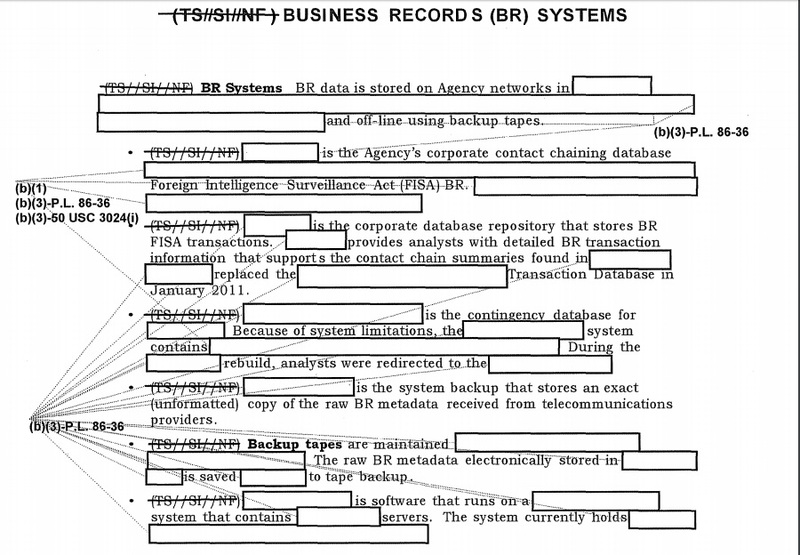 An NSA training presentation (.pdf) from 2007 confirms that BR FISA data were stored in two NSA repositories, although both names had been redacted. An NSA review from June 2009 describes this second database as a "repository for individual BR FISA metadata call records for access by authorized Homeland Security Analysis Center (HSAC) and data integrity analysts to view detailed information about specific telephony calling events". This seems to refer to the complete calling records, and also the PCLOB-report (.pdf) about the BR FISA program says there's analysis software that "provides the associated information about the telephone calls involved, such as their date, time of day, and duration". So probably the second database gave access to these additional details, whereas MAINWAY only contains or provides "summaries of one-hop chains", i.e. selector #1 was in contact with selector #2 and the number of times this happened within a specific timeframe. "NSA is preparing to incorporate the [second database] into the NSA corporate architecture. This transition to the corporate engineering framework will maximize use of the latest technologies and proven configuration management to minimize any security and compliance risks"
2. Database repository that stores detailed metadata information, which supports the contact chaining summaries in [MAINWAY]. Replaced an earlier database in January 2011. So when NSA needs large data centers, that's also because the same sets of data are stored multiple times. Besides backups, there are often separate databases dedicated to a specific purpose or analysis method. As mentioned before, MAINWAY was not only fed with telephone metadata, but also with metadata from domestic internet communications. These metadata include the "to", "from", and "cc" lines of an e-mail, as well as the e-mail’s time and date. Its seems that for contact chaining, no metadata from other kinds of internet communications, like messengers, were used. - Section 702 FAA, which allows access to internet communications between foreigners and Americans from the "PRISM-providers" and "Upstream collection". - The SPCMA regulation, which allows using US person identifiers for querying metadata that have been collected abroad. With collection of internet metadata both overseas (under EO 12333 authority) as well as at the physical and virtual borders of the US (under 702 FAA), NSA probably didn't need the purely domestic ones anymore, to still capture those that are of interest. Also, querying the metadata collected overseas appeared more attractive, because abroad, NSA is allowed to collect much more types of metadata, than inside the US, where collection was heavily restricted by the FISA Court. In a declaration for the FISA Court from February 13, 2009, then NSA director Alexander explained that multi-tiered chaining of phone calls is more efficient and useful, "because unlike e-mail, which involves the heavy use of spam, a telephonic device does not lend itself to simultaneous contact with large numbers of individuals". 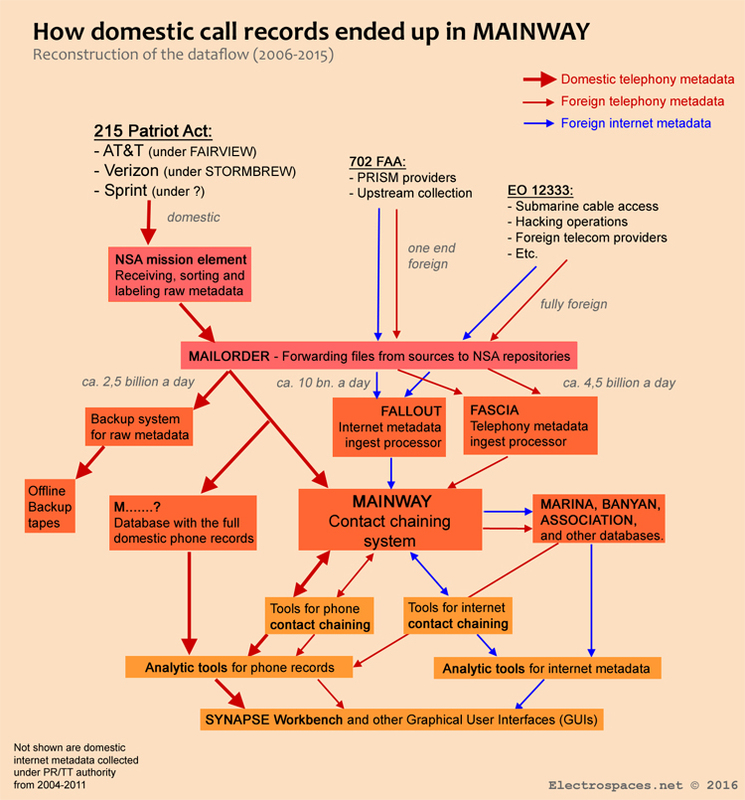 An SIDtoday newsletter from August 25, 2003, that was published in August 2016, revealed that "MAINWAY, a system that uses phone call contact chaining to identify targets of interest, was provided to each of our [Five Eyes] partners. The partners now supply additional contact information to the database to enhance the joint ability to identify targets". We have no documents that show that Second Party analysts are restricted from access to Section 215 metadata, but recently published dataflow diagrams show that MAINWAY has separate BRF(ISA) partitions. According to the secret Budget Request to Congress for 2013, NSA wanted to create (or maybe expand MAINWAY into) a metadata repository capable of taking in 20 billion metadata records a day and make these available to analysts within 60 minutes. But after Snowden disclosed the Verizon bulk phone records order in June 2013, the American public became aware of the actual scope of this program and it became the most controversial part of NSA's activities. In January 2014, the Privacy and Civil Liberties Oversight Board (PCLOB) judged that Section 215 collection was actually of "minimal value in safeguarding the nation from terrorism" and that there was "no instance in which the program directly contributed to the discovery of a previously unknown terrorist plot or the disruption of a terrorist attack". According to PCLOB, the bulk phone records did provide some value "by offering additional leads regarding the contacts of terrorism suspects already known to investigators, and by demonstrating that foreign terrorist plots do not have a U.S. nexus". This however, was not seen as a sufficient justification for the large-scale collection of domestic phone records. In the course of 2015, US Congress eventually enacted the USA FREEDOM Act, which prohibits NSA to collect and store domestic call records in bulk as of November 29, 2015. Instead, the agency now has to apply for a warrant from the FISA Court approving specific selectors, which are then provided to telecommunication providers, who use them for querying their own databases and only the results are handed over to NSA.